If your vet is not attending your mare's foaling, knowing the correct approximate size of the offspring helps you discern whether the foal needs immediate veterinary attention. Lifting the newborn foal up to weigh yourself and him, then subtracting your pounds, is not the only method of weight determination. No matter the breed, foals weigh approximately 10 percent of their mother's weight at birth. That means the typical 1,000 pound thoroughbred mare gives birth to a 100 pound foal, the 1,500 pound warmblood mare's foal is about 150 pounds and the 2,000 pound draft mare's offspring weighs 200 pounds. These proportional weights hold true even if the mare is bred to a larger or smaller stallion. Foals born to first-time mothers are generally smaller than those of older, experienced dams. The normal gestation period in a horse ranges from 335 to 345 days. Those foals born before day 335 tend to be smaller, but those born after day 345 are not significantly larger. At birth, there does not appear to be much difference between the weights of fillies and colts, according to Kentucky Equine Research. It's important to make sure that your mare expelled all of the placenta after delivering the foal. Retained placentas can cause serious infection and death. 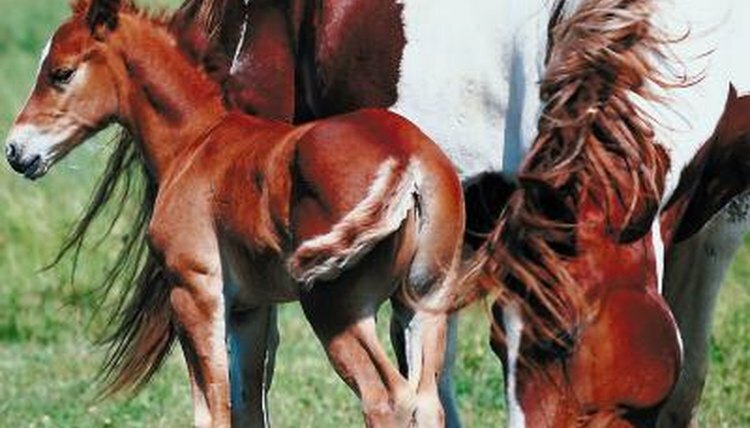 Usually, the placentas passes within an hour of the foal's birth. Don't try to manually remove a placenta. If it doesn't happen naturally within three hours, call your vet. Once the placenta passes, spread it out to make sure there are no areas missing. If there are, contact your vet. If you want to estimate your foal's weight, it might be easier to weigh the placenta than the newborn. The placenta weighs approximately 11 percent of the foal's birth weight. Foals weighing less than 10 percent of their mother's weight tend to be premature. Normal foals stand within two hours and nurse. Premature foals often have difficulty standing. If you aren't sure when the foal was conceived, several factors indicate whether the low-birth-weight foal is premature or had a normal gestation. Premature foals tend to have silky hair, floppy rather than straight ears, tendon weakness -- which prevents standing -- and domed foreheads. Call your vet immediately if you mare delivers a low-birth-weight baby. Whether or not it is premature makes a big difference in the foal's potential survival. Twins are not welcome deliveries in the equine world. If a mare is ultrasounded early in the pregnancy and twin embryos detected, your vet can "pinch" one so one healthy foal has a chance of being born. A mare's uterus is designed to carry only one foal. Mares carrying twins often experience late-term abortions. If the twin fetuses survive until delivery, their low birth weights usually make death imminent. Rarely, one twin might live and the other one succumbs soon after birth. It is extremely unusual for both twins to survive and thrive. University of Illinois Extension: The Foaling Process -- What Is Normal?